Seeing her again reminded me of the wonderful day I spent with her several years ago as we walked through her famous chardonnay vineyard, home of the grapes that made up a large percentage of the Chateau Montelena wine that won the Judgement of Paris contest in 1976. In honor of Helen, I decided to include an excerpt from the chapter on the Bacigalupi Vineyard that was published in my book, Call of the Vine: Exploring Ten Famous Vineyards of Napa and Sonoma. The Bacigalupi Vineyard is located in the central part of the Russian River Valley AVA, and occupies what was known as the Goddard Ranch - an original homestead established in the early 1800’s. The Goddard’s lived on the 121-acre property for over five generations before selling it to Helen and Charles Bacigalupi for $35,000 in 1956. The purchase included two old houses – one that was 100 years old, and the second that was 150 years old. The Bacigalupi moved into the 100-year-old house and slowly started updating it. 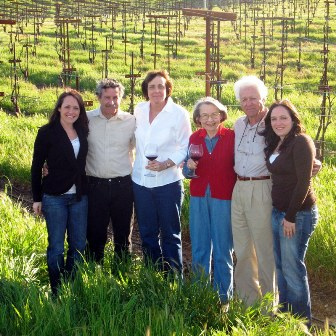 The Bacigalupi’s consulted Bob Sisson, the local UC Davis grape advisor, who was also a dental patient of Charles’s. Bob suggested they plant some of the newer grapes such as chardonnay and pinot noir because they would perform well in the more moderate climate of the Russian River. However neither Helen nor Charles had ever heard of those types of grapes and couldn’t find a place to buy them. Finally someone suggested they contact Karl Wente in Livermore who had started a winery and nursery several years before. 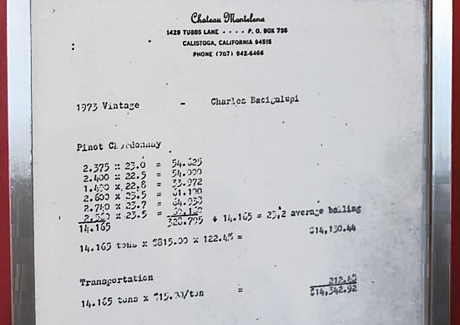 So Charles telephoned Karl who invited him to drive to Livermore, where Charles purchased the budwood for what has now become known as the famous Wente Chardonnay clone. They grafted the Wente clone to St. George rootstock with the assistance of Joe Rochiolo who lived down the road and had taken a class at UC Davis to learn how to graft vines. The resulting four acres of chardonnay became known as the Paris Tasting Block when Mike Grgich, winemaker at Chateau Montelena at the time, contracted to buy the 14 tons it produced in 1973. Mike blended it with other Sonoma and Napa grapes to produce the 1973 Chateau Montelena Chardonnay which won the 1976 Judgment of Paris, beating out wines from Puligny-Montrachet and Meursault Charmes. This single event caused people around the world to recognize that California was producing wines of exceptional quality. Once the results of the famous tasting in France became known, Helen had many offers for her chardonnay grapes, and to this day continues to sell them at a premium to high-end wineries in Napa and Sonoma counties. The original Paris Tasting Block, planted in 1964, still exists, and is surrounded by many other blocks of chardonnay and pinot noir vines. I met Helen on a sunny Spring morning at the Bacigalupi tasting room on Westside Road outside of Healdsburg. She was dressed in a burgundy-colored corduroy blazer, with navy slacks and sensible leather loafers to walk in the vineyard. She shook my hand with a strong grip and smiled, her blue-eyes twinkling behind round glass. 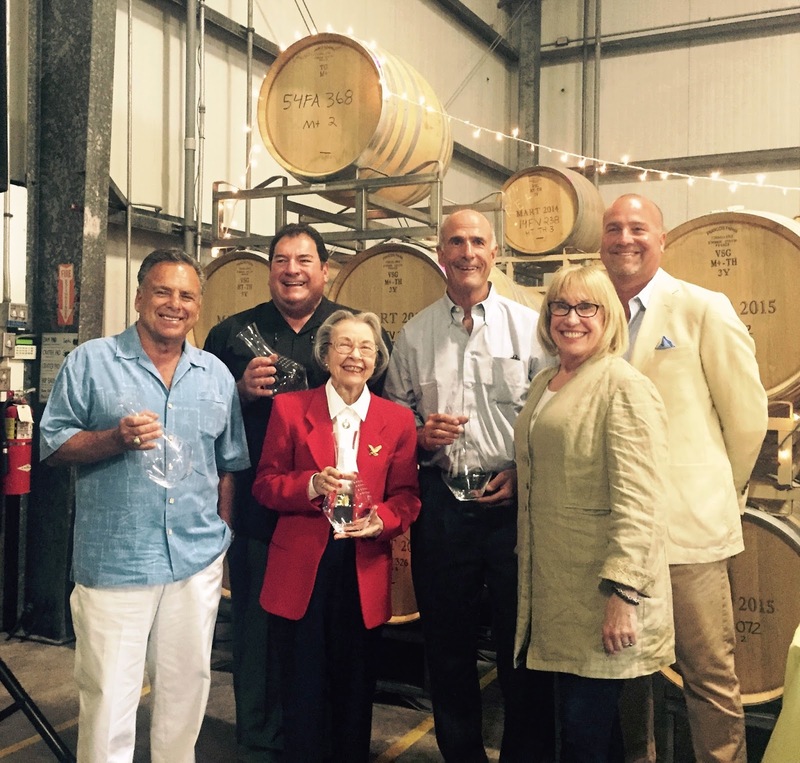 She looked every inch the successful grape grower and smart businesswoman that she was known to be – even though she was 87 years old. “Are you ready to go see the vineyard now?” Helen asked. “Of course,” I jumped to my feet. I saw Helen into her old Mercedes sedan before climbing into my vehicle and following closely behind. We didn’t have to drive very far, because Helen turned onto Goddard Road just a few minutes after we drove north on Westside Road. We traveled on a narrow paved road that climbed the hill and made several sharp turns before dead-ending in front of a small wooden house with several outbuildings and barns surrounding it. All around the buildings and climbing up the slopes were rows of vines on tall trellis systems. “Wow, you live in the vineyards,” I said, surprised. “Yes, so when people tell me that spraying sulfur on vineyards is dangerous, I say nonsense. Do you think I would live where I could be poisoned?” She laughed and starting walking towards a block of vines near a large barn. “Where is the Paris Tasting Block?” I called after her. I followed rapidly behind her, and then approached the vine with awe. Here was living history. This huge magnificent grape vine was part of the story that put the California wine industry on the map. Its fruit had gone into a bottle of wine that French wine experts, in a blind tasting, had declared was better than some of the most famous wines of Burgundy. Staring at the vine I realized it stood about seven feet tall on a modified California sprawl trellis system, which reminded me of some of the taller pergola trellises in Italy. Healthy green leaves spread out in many directions, and the shoots were filled with many small grape clusters in full bloom with small white flowers. The trunk was massive, about 10 inches across, but also quite tall, so that the grape clusters were around shoulder height. Helen walked over and stood next to the vine. It dwarfed her 4 foot 10 inch frame. “So what do you think?” she asked. “So you drove the grapes to Chateau Montelena yourself?” I asked surprised. “Yes, I had some people help me pick, but Charles was working in town, so we loaded the grapes into an old trailer which I attached to the back of that Volkswagen van.” She gestured to an old rusty Volkswagen parked in a wooden shed near the house. “It ended up taking five trips, and I took Highway 128 through Alexander Valley and down into the northern part of Napa Valley. That Volkswagen didn’t have much guts though, and so I had to gun it to get it over the hill and hope no one was in front. Fortunately back then, there wasn’t much traffic. Later we got a used Chevrolet and it had a lot of power. It actually ‘growled’ in low gear.” She grinned widely. I nodded and she led me past the Paris Tasting Block to see some newer sections of pinot noir and chardonnay where the rows were more tightly spaced. As we walked through the rows, I asked Helen a question that had been on my mind. “So what does Bacigalupi mean?” I made sure to pronounce the ‘c’ as a “ch’” as I had heard her do. For the rest of the story, please see: Call of the Vine: Exploring Ten Famous Vineyards of Napa and Sonoma.